I spent most of my childhood completely immersed in music. Like many, the world of music intrigued me and I had to be involved, somehow. Eventually, I figured out my path and so did another longtime music fan, Emma McKee, but her route was decidedly less traditional. Having now fashioned custom, very personal and one of a kind cross stitch art onto jackets and other clothing for everyone from Major Lazer to Chance the Rapper, and dozens more Chicago creatives that have all accepted Emma's gifts with excitement and honor, 2016 has served as a turning point for Emma's involvement in the fashion game, but her journey didn't start at being donned the Stitch Gawd and watching her designs on national television. Rather, her success is the product of a lifetime of passion, creativity, and a genuine love for the people in her life. Born in Georgia, the daughter of a preacher and an opera singer, music was always important to Emma, albeit with less rap and a lot more Dvořák and classical influence in the early years. Emma moved around a bunch as a child, landing in St. Louis for her middle school years. It was there that she began embracing and relating to hip hop; amidst an era that birthed cult classics like Murda Inc., Ruff Ryders and of course STL's claim to fame, Nelly. At the time, teenage Emma may not have fit the profile of what a hip hop fan looked like in a lot of people's minds, but it was in the music that she sought refuge, finding a welcome escape within in her headphones, sparking a love for the sound and culture that embraces her today. From Georgia, to St. Louis, to Oklahoma, all the way north to Toronto for college, Emma had initially intended to focus on opera following in her mother's footsteps, but she soon decided it just didn't feel right. Changing course, she applied late to the University of Toronto where she studied literature, began working in a recording studio, and immersed herself in the pre-Drake Toronto music culture. When her work visa expired and complications renewing it forced her out of Canada, Emma migrated south to Chicago after some careful consideration. Arriving in Chicago in 2011, Emma had little cash and no friends nearby at the time. Being new to a big city all alone would be difficult for most, and that narrative was certainly true at times for Emma as well. Leaning on a childhood of learning to accept and value her differences, Emma found her way back to the arts, music, and people that made it all happen here in Chicago. Anyone who's been around since then knows that the city's scene underwent a huge transformation in the years leading up to and after 2012, the year the city's rebirth of music culture caught the attention of the world. This atmosphere provided a perfect opportunity to find a place within the changing landscape of the arts and infrastructure that supported them. At the time, Chicago was flush with talented artists, musicians and visual artists alike. Rappers, painters, sculptors, designers etc., it seemed as though the Second City was represented well across artistic landscapes. In walks Emma McKee, who with a needle in one hand and thread in the other would set out to take the art of cross-stitching from being the habit of little old ladies in rocking chairs on their wrap around porches surrounded by white picket fences to the forefront of the Chicago hip-hop scene and beyond. A devout daddy's girl, Emma sought to begin her cross-stitching journey by using it to make an attempt at evening out the unbalanced relationships she had with her parents. She made her first piece for her Mom who had tried (and failed) to get her daughter interested in the craft as a child. A British tradition she grew up with as a little girl herself, the previously rejected hobby later ended up turning into Emma's greatest passion. After teaching herself the art to complete a gift for Mom, Emma couldn't put down the needle and thread and her inspirations quickly drifted back to her love for music. One of the first pieces Emma created was Will Prince's "Hey Ma" artwork that you see above. The original artwork sits in the Haight office, which so happens to be the place I first met Emma a few years later. Straight out the gate, other creatives immediately took to Emma's art, even if they weren't sure what it was at first. Cross stitch just isn't all that prevalent among the young and hip, but Emma made it evoke strong emotions of acceptance and appreciation among the artistic community. Emma's motivations and inspirations were and remain pure. There was no need for approval (although it was appreciated) and she certainly couldn't fathom selling any of her work. She just made art inspired by the people she admired. It wasn't until JC Rivera, aka The Bear Champ, came along and sparked the idea to put her artwork on clothing. 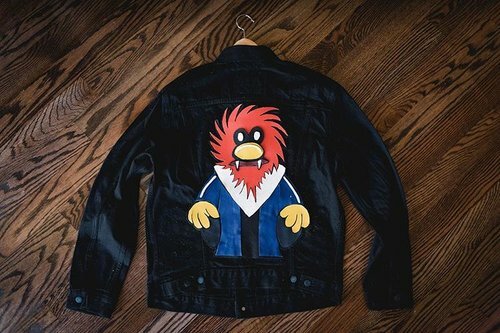 Little did he know that his request would lead to the creation of some of the most sought after custom jackets in the city. Once the word got out, Chicago creatives began seeking out Emma's work and trying to find out how they could get their own. Even when the opportunity to monetize her art presented itself to Emma, she still had no interest in doing that. Charging for her work would somehow take away the ability to say no to people and take this thing that was motivated by her passion and love for the subjects she hand selected and instead make cross stitching a job. Not to mention, the time spent on many of these pieces would demand an extravagant price tag, even if she charged a minimum wage rate. Emma is on the other hand an avid collector of artwork as well as a creator of it, and has happily accepted trades from names like JC Rivera, Hebru Brantley and others which she displays proudly in her small Noble Square apartment. Whether for trade or for the love, Emma's ability to do the work she wants with whom she wants continues to be the goal. During the creation of each piece, Emma spends a lot of time thinking about the person she's creating for. For the most part Emma doesn't select people she knows very well, but instead uses the opportunity to discover what makes her subjects tick and then pieces together one of the most thoughtful gifts that person has likely ever received. Emma really sets the gift giving bar high as hell for everyone following up her "just because" masterpieces. While commissioning her time and craft has not been an option for most people, there have been some exceptions, one being Chicago's prodigal son, Chance The Rapper. When the biggest name in music and one of your biggest personal inspirations asks you to do some work, you do it. A huge opportunity for the up and coming artist, but it also exposed Emma to what it might be like if she did begin to sell her work or allow people to commission her for projects on a more regular basis. Definitely her biggest project to date, the hard work resulted in three jackets being worn during Chance's current leg of the Magnificent Coloring Tour. Emma worked with Levi's directly to select the perfect vintage deadstock, she was able to work with leather for the first time, and even had Mom come out to assist with meeting deadlines. As a result of her relationship with Chance and his team, Emma's seen her jackets cover Billboard magazine and travel across the country in front of millions of fans, but it's also come with some loss of creative control, tight deadlines, and stress in an area of her life that that has otherwise been a stress reliever. She's sacrificed a little for this project, but for good reason. Chance holds a special place in Emma's heart. Although their personal relationship is still fairly new, Emma calls Chance a "guiding light" during her time in Chicago. Someone who's been a subconscious connector in her life. Introducing a new Chicago resident to so many of the great things the city has to offer. So yes, there was sacrifice made during the execution of this project, but there isn't anyone more deserving in Emma's mind than Chance. Emma credits her creative subjects with so much, but when asked how she sees her work in comparison to the work of people she memorializes in her cross stitch projects, she humbly doesn't see it as influential. Perhaps her forward looking perspective keeps her from recognizing the great things she's accomplished over the course of this past last year, but Emma went from a novice making a present for Mom to working alongside some of the largest names in music, and that's nothing to scoff at, even if it was all an accident. We talked six months ago and again just recently for this story, and Emma still doesn't have a plan for where this is going, but she's ready to ride the wave. Emma remains motivated to continue creating by the long and continually expanding list of people that mean so much to her. She doesn't want to leave anyone out of this moment. Like DJ Oreo said above, receiving a jacket from Emma is beyond exclusive, it's like being in a secret club, but that club is growing. We can't give you any tips on getting a 1/1 from Emma McKee, but we can tell you that celebrity is not a requirement, just be good at what you do and be a genuine friend. If the rest of the world placed as much value on these sentiments as Emma does, we'd all be much better off. Come for the art, stay for the perspective. Emma McKee's generosity is abundant and inspiring.